Enjoy the comfort of this house functional and complete equipment. Its decoration in Provencal colors and harmonious geaies and furniture conférent it a relaxing atmosphere. 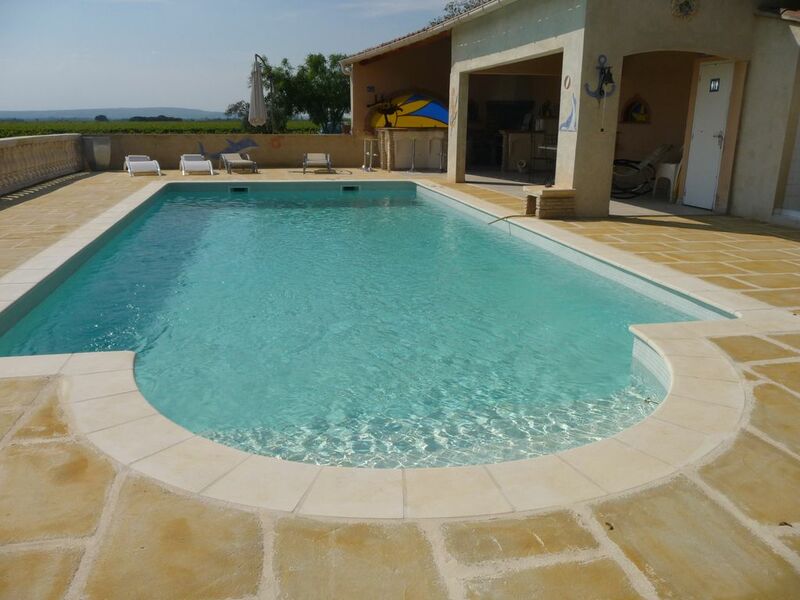 You will be very quiet in the superb site of vineyards in Rasteau Côtes du Rhône. You will love due to its stunning views and lace Montmirail of Mont Ventoux, the green areas and gastronomy, its shops and its rich heritage (Vaison La Romaine - Orange - Avignon-Nîmes). The area offers outdoor activities (hiking, golf 15 km, mountain biking, its typical architecture, its sights and numerous cultural sites nearby. Water park in Monteux 20 minutes with Spirou Parc Come to judge! No pets. Electric heating. Air conditioning. Safe. join us in this quiet and relaxing where you will be warmly welcomed by the vineyards of the Côtes du Rhône face Montmirail and Mont Ventoux the Giant of Provence! The house boasts stunning views of the shared pool to another location. The villa consists of an independent entrance, fully equipped kitchen living room with flat TV, CD, DVD, VCR .... two bedrooms, a bathroom and a separate toilet Outdoor garden furniture with hot tub sun and BBQ Nearby with its fridge and summer kitchen you can climb the laces of Montmirail, a few kilometers climb Mont Ventoux, on foot or by bike. The villa is from your walks, we will guide you for winery tours, hiking tours, and other activities! in rasteau in may the gourmet getaways, in july the votive feast and the night of august 14 feast of the wines inform you in OFFICE OF TOURISM of RASTEAU !!! and many more that we will tell you as and when you stay with us! join us in this quiet and relaxing where you will be warmly welcomed by the vineyards of the Côtes du Rhône deal with lace Montmirail and Mont Ventoux the Giant of Provence! The house boasts stunning views of the shared pool to another location. The villa has a private entrance, toilet fully equipped kitchen living room with flat TV, CD, DVD, VCR .... two bedrooms, one bathroom and one separate toilet Garden furniture outside with bath sun and BBQ Nearby you can climb Montmirail, a few kilometers ascent of Mont Ventoux, on foot or by bike. The villa is from your walks, we will guide you for winery tours, hiking tours, and other activities! rasteau in May to the gourmet getaways always in May gourmet getaways, the votive festival in July and the night of August 14, feast of wines to find out TOURIST of RASTEAU !!! Shower room with extra-flat shower tray and flower-shaped washbasin with pale green decoration reminiscent of the Vaison -La-Romaine columns (see photo in support). the bathroom is ultra modern and in perfect condition The toilet is sorted and separated from the bathroom. Swimming pool 10 x 6m with its giant barbecue (see photo to the press) deal with Montmirail, a bar, a fridge, a garden furniture and chairs, sun beds and bathroom textilene eclipses sun , a shower and an outhouse in addition, balls games, table tennis, playing wooden keel: the Mölkky and bike rental - Electric heating and air conditioning, safe and large garage locking for the vehicle and another. Vaison la Romaine and Orange: 15 Kms - Carpentras: 20 Kms and Avignon: 40 km Airport and TGV station - the giant of Provence Mont Ventoux 35km and the sea to the Grande Motte and Les Saintes Maries de la Mer in Camargue 100 kms - a lake 2 kms to fish or walk - River 10 kms and shops and the town center 3 km from Sablet and Rasteau and the Golf du Moulin on Orange shiny new with its restaurant awaits you for a good relaxing time!